The Panel Bed is a fun and safe way for your daughter to drift off to sleep. This bed features feminine touches such as a Fleur-de-lis-inspired design on the corners, serpentine tops, ribbon and floral scrolls and an apron base, giving the bedroom space an antique and classy atmosphere. This bed is strong and safe and includes slat rolls so you won’t need to purchase a bunky board or box spring. This Panel Bed is completed with a White Victorian finish that will match the décor in any youth room. 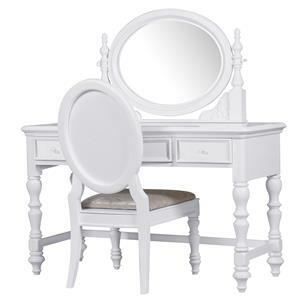 Perfect for getting ready for school or a fun event, this vanity is sure to help with all of your little girl’s needs. It has two side drawers and one center drawer with a drop-down front. Designed with feminine touches such as decorative raised panel drawer fronts, trumpet legs and crystal knobs, this piece gives your daughter’s bedroom space an antique and classy atmosphere. The oval vanity mirror has beautiful features such as rounded Dentil Moulding, two trumpet posts on each side, and floral scrolls in the corners. This bed has simple lines and details that are subtle and careful not to overpower the personality of a room. A superior bed for the casual lifestyle of kids. Built with a durable Cottage white finish this bed is refreshing and cheerful like the great outdoors in summertime. A slat roll eliminates the need for a box spring and adjustable bed rail locking positions accommodate optional under bed storage. Simply versatile this bed will please either boy or girl. A bed like this is also inviting as a guest retreat. When it comes time to make to the move into a big bed, you want something with style and function that can grow with your child. The Low Post bed is a great way to make a statement in your child’s room with the versatility to fit any style. The under bed storage is a great place for children to store their belongings. It features two drawers and four open shelves to display anything from books to sporting equipment. Every kid dreams of having a bunk bed. 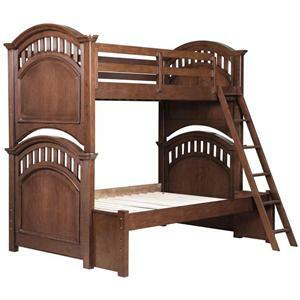 This classic bunk bed is a great statement and functional piece to have in your child’s bedroom. 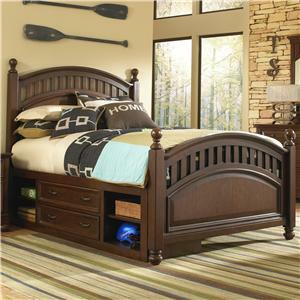 The bed is finished with a rich American Cherry and that is durable for an active lifestyle. The bunk bed is constructed for children with active lifestyles. The rounded corners, steel bolt reinforcements, and double bolting on the bunk bed rails provide safety and security. The bunk beds include slat rolls eliminating the need for bunky board or box springs. 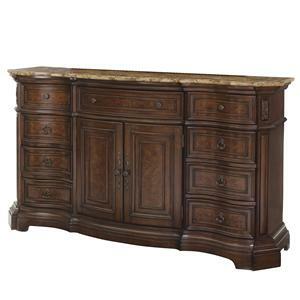 Store all your belongings away with the fashionable and glamorous Dresser. 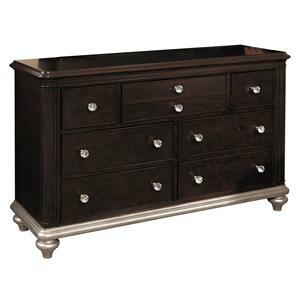 With a distinct style, the dresser is finished with black cherry and a silver base. The dresser features seven drawers in various sizes making it easy to keep things organized and safely stored away. Each drawer is styled with sparkling crystal styled knobs. Pair the Dresser with the Mirror to complete the Hollywood glam look. The Panel Bed is a fun and safe way for your daughter to drift off to sleep. This bed is created with feminine touches such as a Fleur-de-lis-inspired design on the corners, serpentine tops, ribbon and floral scrolls and an apron base, giving the bedroom space an antique and classy atmosphere. This bed is strong and safe and includes slat rolls so you won’t need to purchase a bunky board or box spring. 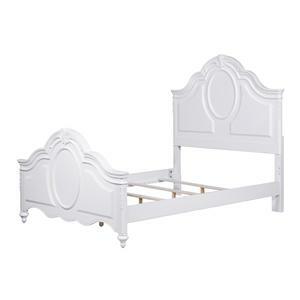 This Panel Bed is completed with a White Victorian finish that will match the décor in any youth room. This door dresser offers a variety of storage options with its door and drawer design. Nine drawers line the ends of the dresser, while two doors with an adjustable shelf are graciously placed in the center. Giving it a classic feel are bracket feet, ring pull hardware, waist molding and carved acanthus leaf accents. All finished in a brilliant European Cherry finish, there is simply no denying the luxurious appeal of this door dresser. Set upon fun round twirly feet this chest of drawers is a great hold all piece with five drawers. 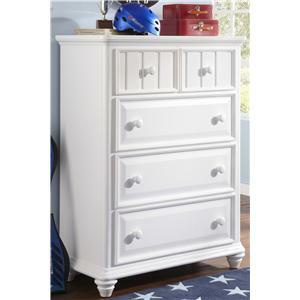 Simple carved wood features layer this chest with depth from the clean and all white finish. A subtle plank pattern on the top two drawers adds a fresh directional turn to enhance the vertical stack of drawers. Durable drawer access is created with complementary big knobs. The vertical rise and small base of this chest makes this the best option when space is limited. SLF, Inc. is a multi-divisional, globally connected, design and marketing company that produces high quality case goods in the good, better and best categories. SLF is now building a reputation as a design leader with one of the fastest new product development processes in the industry - going from design concepts to production in as little as 60 days. Abandoning the old-school models that plague much of the industry, SLF has created three primary divisions - SLF Signature, SLF Select, and SLF Asia. SLF Signature and SLF Select are both headed by experienced management teams and focus directly on their respective customer base, increasing their ability to respond to retailers with great designs, fast delivery times, and the lowest costs possible. SLF Signature creates products in the upper price-points that are fashion-forward. SLF Select creates products at the promotional price-point and focuses on tremendous value. SLF Asia is responsible for the sourcing, quality and on-time delivery for both SLF Signature and SLF Select products.